Roppongi (六本木) is a district of Minato, Tokyo, Japan, famous for the affluent Roppongi Hills development area and popular night club scene. A few foreign embassies are located near Roppongi, and the night life is popular with locals and foreigners alike. It is in the central part of Tokyo, south of Akasaka and north of Azabu. The name "Roppongi", which appears to have been coined around 1660, literally means "six trees". Six very old and large zelkova trees used to mark the area; the first three were cleared, and the last were destroyed during World War II. Another legend has it that the name comes from the fact that six daimyōs lived nearby during the Edo period, each with the kanji character for "tree" or a kind of tree in their names. Roppongi was not extensively populated until after the Meiji Restoration, although the area was trafficked for centuries and served as the site of the cremation of Shōgun Tokugawa Hidetada's wife in 1626. After World War II, during which the area was again destroyed, this time by aerial bombing raids, the United States Army and Allied government officials occupied several facilities in the area, beginning Roppongi's reputation as a neighborhood with large numbers of non-Japanese. Several large US military installations were located in the nearby area, with Hardy Barracks probably the most significant (the US Embassy Housing Compound and Akasaka Press Center including Hardy Barracks Recreational Lodging, Stars and Stripes office and heliport are still there). Surrounding the military installations were many Japanese-owned restaurants, pool halls, bars, and brothels which catered to US military personnel but were also often frequented by Japanese customers. Starting in the late 1960s, Roppongi became popular among Japanese people and foreigners alike for its disco scene, which attracted many of Tokyo's entertainment elites. Contributing to the international scene was the location of several foreign embassies and foreign corporate offices in the Roppongi area. However, many dance clubs shut down in the recession following the market crash of 1989. 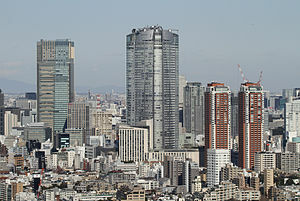 The Roppongi area received a major economic boost in 2002–2003 when the Izumi Garden Tower and the Roppongi Hills high-rise complexes were completed. These projects brought high-end office and condominium space to Roppongi for the first time. The Tokyo Midtown project, which was completed in 2006, and includes the first Tokyo Ritz-Carlton Hotel, continued this trend. The area features numerous bars, nightclubs, strip clubs, restaurants, hostess clubs, cabarets, and other forms of entertainment. Among the expatriate community, the area tends to be favored by business people, students, and off-duty US military personnel. Overall, the neighborhood caters to a younger crowd. Clubs can range from large, multi-level establishments, to smaller one-room clubs located in upper levels of buildings. In more recent times some of the larger venues with known Yakuza connections have closed. Around Roppongi crossing are a number of clubs which feature foreign performers. There are also a number of both foreign- and Japanese-operated bars catering to different crowds. 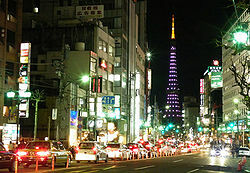 Recently, Roppongi has enjoyed a growing reputation for its organized events such as art festivals, dart and billiard tournaments, pub crawls , robot exhibitions, beauty pageants, and so on. Restaurants in Roppongi vary from upscale Japanese fare to popular international restaurants. In 2006, Nigerian immigrants to Japan began opening a number of bars and nightclubs in the area, following an earlier group of innovators who had been in business in Roppongi for many years. The Nigerians were noted for using visible, high-pressure tactics to draw customers to their bars. In 2009 and 2010 a series of drink-spiking incidents, in which customers reported being drugged and robbed, were linked to Nigerian-owned bars. The incidents resulted in the United States embassy in Japan warning US citizens to avoid certain bars and clubs in Roppongi. An investigation by The Japan Times in July 2011 found that though drink spiking occurred, most of the incidents did not involve criminal activity. Many customers claimed unusually severe hangovers after nights spent in Nigerian-run establishments. Similar complaints are often made about non-Nigerian bars in Roppongi that offer unlimited drink packages and often lace drinks with hard liquor to minimize customer consumption and increase profit. Mori Building Company and The Pokémon Company have their headquarters in the Roppongi Hills Mori Tower. A number of multinational firms have their Japanese offices in Roppongi, including investment banks Credit Suisse, Goldman Sachs, State Street, manufacturer Corning Incorporated, and law firms Allen & Overy, Davis Polk & Wardwell, Orrick, Herrington & Sutcliffe and Skadden, Arps, Slate, Meagher & Flom. Public elementary and middle schools are operated by the Minato City (the Minato Ward) Board of Education. Roppongi Junior High School is located at Imoarai-Zaka, in Roppongi. Public high schools are operated by the Tokyo Metropolitan Government Board of Education. Roppongi High School is located in Roppongi. Toyo Eiwa Jogakuin is private girls school, also located at Torii-Zaka in the district. The American School in Japan Early Learning Center is in Roppongi Hills. ^ "Tokyo Weekender – Weekender Archives: Roppongi – A history of our favorite watering hole". Archived from the original on September 27, 2007. Retrieved 2007-09-27. ^ "Feature: Dark Matter," Metropolis, March 10, 2006. ^ "Trying to tame Tokyo's adult playground". Los Angeles Times. January 26, 2010. ^ Richard, Dreux, "Japan's Nigerians pay price for prosperity", The Japan Times, 19 July 2011, pp. 10-11. ^ Richard, Dreux, "'Something My Spirit Wanted'", Metropolis, #905, 29 July - 11 August 2011, pp. 14-15. ^ "Company Profile." The Pokémon Company. Retrieved on December 14, 2011. "Head office Roppongi Hills Mori Tower 18F, 6-10-1 Roppongi, Minato-ku, Tokyo 106-6118"
^ "Company Profile." Mori Building Company. Retrieved on December 14, 2011. "Headquarters Roppongi Hills Mori Tower, 6-10-1 Roppongi, Minato-ku, Tokyo 106-6155, Japan"
^ "会社プロフィール." Mori Building Company. Retrieved on December 14, 2011. "〒106-6155 東京都港区六本木6丁目10番1号 六本木ヒルズ森タワー"
^ "Being Inc. "About us"". Being Inc. Retrieved May 23, 2011. ^ 会社概要. Wrestling New Classic (in Japanese). Retrieved December 27, 2012. ^ "Minato Board of Education". Archived from the original on 2007-11-16. Retrieved 2007-10-30. ^ "Contact Us Archived 2014-05-29 at the Wayback Machine." The American School in Japan. Retrieved on May 28, 2014. "Early Learning Center 6-16-5 Roppongi Minato-ku Tokyo 106-0032 Japan"
^ "School Profile Archived 2014-05-29 at the Wayback Machine." The American School in Japan. Retrieved on May 28, 2014. 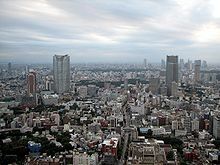 "Location: Campuses in Roppongi and Chofu, Tokyo"
Wikimedia Commons has media related to Roppongi. Wikivoyage has a travel guide for Tokyo/Roppongi.